Click here for a sample of ANC026. These are the whispers of death as they shuttle back and forth, through the tapestry, through the cloak, crossing and double-crossing, through the weave, the weft and warp, warping the soldiers and swords and crosses and fields of red and white and blue and red again. With his transmission of the first transatlantic radio signal in 1902, Guglielmo Marconi inaugurated an era in which "every day [saw] humanity more victorious in the struggle with space and time." Change came about rapidly, albeit in the form of progress for some more than others. The Bolognese tinkerer would go on to innocently state that the wireless era would make war an impossibility, when in fact it was a short time before he would take up with the Fascists and find himself apologizing via the electromagnetic spectrum for camerata Benito's Ethiopian atrocities. 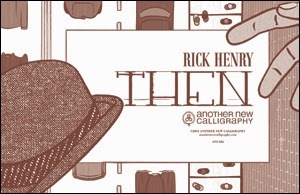 Rick Henry's collection of prose poems, Then, also serves as a communiqué from the early and mid-twentieth century. The snapshots here are motivated by figures larger-than-life and refreshingly mundane: Einstein, unemployed riveters, Dorothea Lange, a corseted babysitter, Picasso, etc. While McCarthy and Hoover spew their ethics, two friends amass a cadre of refrigerators to lower the mercury degree by degree. Werner Heisenberg inexplicably shoots marbles while languages both computer and cultural are explored. Every outbreak of influenza or syphilis is balanced by frenetic dance practice and exacting piano lessons. Then is a world of lawn chairs and rayon stockings shadowed by battlefields and relentless transformation. It is a world much like our own. ANC026 is out of print.